To try to estimate where a retracement will stop is called “to catch a falling knife.” In other words, no reliable rules exist to tell you where a trend correction will end or when the primary trend will resume. One of the chief uses of indicators and combined indicators is to get guidance on where and when a retracement will stop. 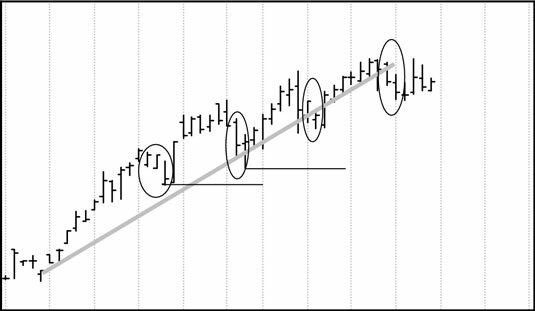 Your tolerance for retracements is the key to deciding in what time frame you want to trade. If the security you want to trade regularly retraces 50 percent and the prospect of losing 51 percent turns you into a nervous wreck, you need to trade it in a different time frame — or find another security. A retracement won’t exceed a significant prior high or low. In this figure, for example, the second retracement doesn’t challenge the lowest low of the first dip, and the third retracement doesn’t challenge the second. This is cold comfort because knowing where it won’t go doesn’t help you figure out where it will go. Look for round numbers. Research shows that support and resistance levels actually do occur more often at round numbers than chance would allow. Use the 30 percent rule. Measure the percentage change and assume that a majority of traders will place stops to avoid losing more than a certain percent, such as 30 percent. The problem with this idea, and it’s a chilling one, is that you’re measuring from a peak and you don’t know the price level where the majority of traders entered. Logically, you should assume that they’re protecting 70 percent of their personal cash gain from their entry, not from the peak. To measure from the peak would be to say that traders make decisions based on opportunity loss rather than cash loss, and while this contains a germ of truth, it’s not a reliable assumption about crowd behavior.